In the midst of the final editing process, I am beginning to wear one of my other producer hats. Besides hats, another analogy would be like the guy who used to entertain on the old Ed Sullivan show. He would start with a lot of dinner plates and poles. He would get a plate spinning on the end of a pole and then begin to spin another and then another and another. Before long, the first plate would slow down and he would have to get it going again. In no time, he had many plates twirling and was in a fevered dash to keep them all going. Well, I just added another very important plate to a pole. That is the role of spokesperson. With a couple of localized market television interviews about the film under my belt, I’ve started accepting speaking engagements. In a matter of about a month I’ve spoken to about four groups. You never know what you think or truly believe about something until you try to explain it to someone else. The TV interviews help me clean up my sound bytes. The speaking in public helps me get an instant response to what people find interesting about the Tarzan saga. From the sale of the Tarzan poster and a few freelance art jobs, I purchased a LCD projector. Allison helped me put the documentary trailer and some footage and outtakes on a DVD. I dusted off my amp/speaker and was ready to go. 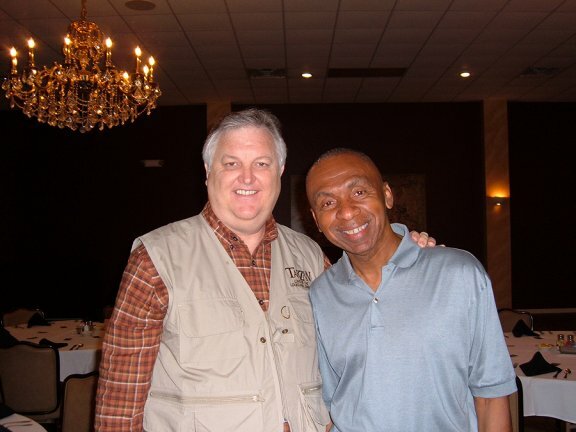 I have known Larry Williams from Broadmoor Baptist Church in Shreveport for many years. He has always been kind and encouraging to me. He invited me to speak to a group of ladies from his church. 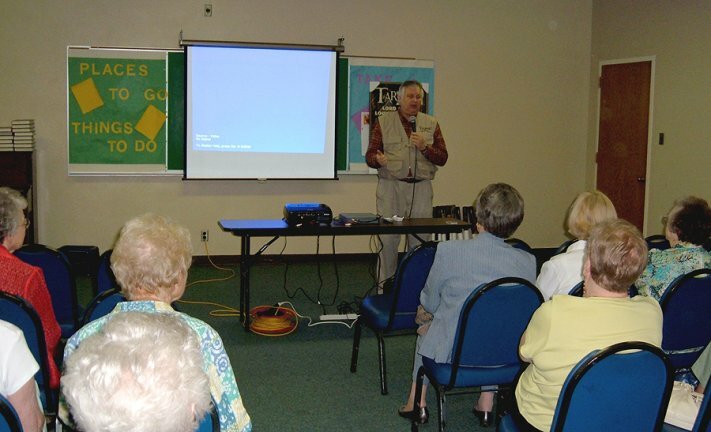 Well, over 50 ladies attended the gathering and they were all excited about the project and many had no idea that the first Tarzan film was made in Louisiana. Actually, footage was shot in the Morgan City area for the first two Tarzan films. While the second Tarzan film, Romance of Tarzan is virtually lost, it has been strongly believed that some of the Louisiana filming was part of that film. One of the ladies said that she loved the Tarzan films as a girl. This has become a constant response when I talk to someone about Tarzan. Last year while getting interviews in Morgan City, we met Herman Hartman. Herman is a wonderful man who retired as an educator and was head girls basketball coach at Southern University for years. He is really excited about our documentary and is helping to make it a success in his area. We have become friends and during one of our conversations I mentioned that I wanted to have a screening of the documentary in Morgan City first. Herman is a big picture guy. He knows that to have a successful showing of the documentary it takes time and a building of synergy. 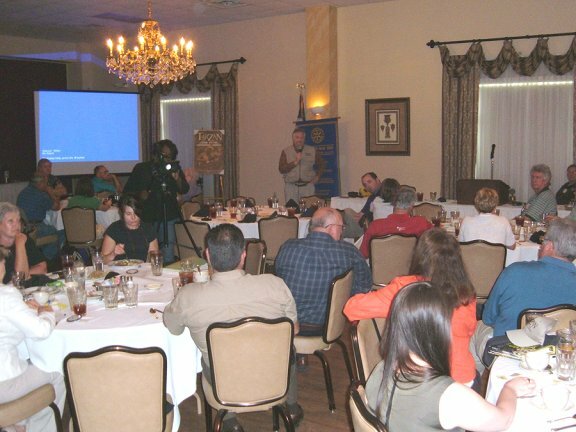 He invited me to speak to the Rotary Club in Morgan City this past April. In some of our conversations, Herman and I had talked about where the films could be shown. Before the club meeting he drove me over to the giant auditorium. There we met with Anthony Governale, Jr. who is the Assistant Manager of the Municipal Auditorium. The theater portion holds almost 1,000 folks in nice seats on slanted flooring. It is perfect to show the film. The stage is plenty big for the screen and any size orchestra I can get to play the music in sync with the original film. Anthony gave me a copy of a newspaper article about the capturing of a German spy in connection with the Tarzan filming. Herman is researching that now but he hasn’t been able to nail down all the facts. It would be pretty exciting if it is true. It is a story based on a newspaper article that tells of a woman who impersonates a man to get a job on the Tarzan film to spy on a shipyard outside Morgan City. The article also claims that German soldiers were hiding in the swamp waiting to attack. 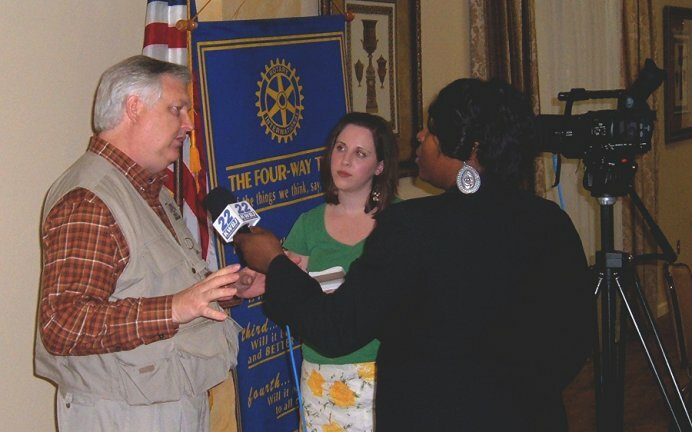 Before going down the Morgan City for the Rotary Club meeting, I contacted the Daily-Review Newspaper in Morgan City and sent them a press release. I also called Danika Foley from the Morgan City television station KWBJ-TV. The paper ran the release two days before I arrived and sent reporter Lee Hudson to interview me. Danika came to the luncheon and taped an interview also. Danika and the paper have been so very good to us in reporting the progress of the project. The Rotarians were very receptive to my presentation and many were very knowledgeable about the Tarzan film. Afterward, Carrie Stansbury and I visited about our having the first showing of the documentary and original film at either a weekend event or even a Tarzan festival. The city had considered having a Tarzan festival several years ago but couldn’t work it out. Carrie handles both tourism and represents the Louisiana state film office in the basin area which is known as the Cajun Coast. As part of our conversation, Carrie and I discussed somehow having an exhibition of Tarzan and Burroughs memorabilia. I’d love to hear from anyone in the “Burroughsphere” that might be interested in helping pull together a first class exhibit. Part of my goal is to have a screening in every big city in Louisiana. The exhibition would go to every city with us. Herman also set up a meeting with Mayor Timothy Matte that afternoon. 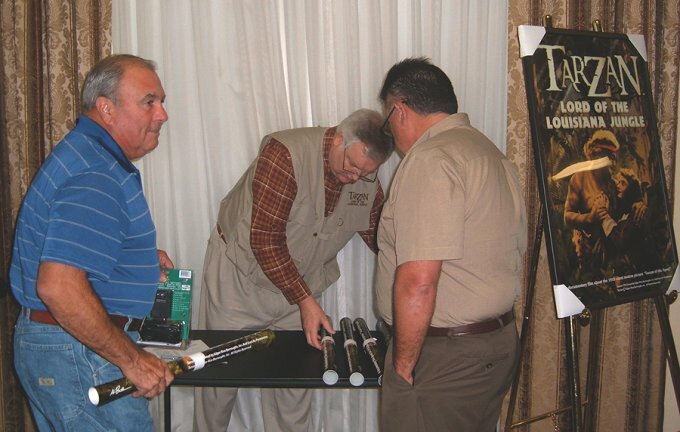 I had met with Mayor Matte when I first went down to Morgan City. He was as gracious that afternoon as before. It meant a lot to me to be able to report to him that Allison and I had been working very hard and were nearing completion. On my way out of town, I went by to see Cajun Jack but he was out on his boat giving a tour of the swamp. about the documentary and Tarzan film. Many have loved the Tarzan story for years. 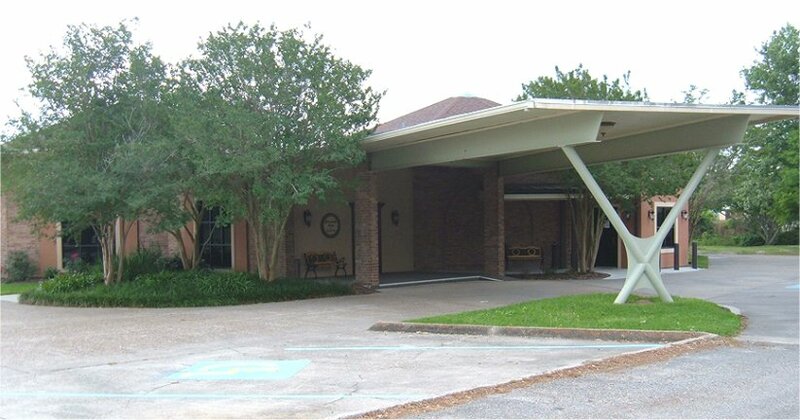 This is the Petroleum Club in Morgan City. It is a beautiful facility for banquets and receptions. This is where the Rotary Club meets each week. You may remember reading about Herman in the article about the Morgan City interviews. He invited me to speak to his Rotary Club and has a wonderful and helpful heart. Much of the success for the Morgan City screening of the films will be going to Herman. Knowing Herman, he will give the glory to God. By the way, what do you think of my monogrammed vest? Thanks to the work of Mary Seale and Kathy Falkner Dreher. These ladies and I were childhood friends. I got the idea of the vest from Bill Hillman. One of my favorite parts of my Tarzan presentation is the question and answer section. Most want to know what 'Umgawa' literally means. They also want to know if there are still monkeys in the swamps. My answer to the monkey question is that they will need to buy the DVD. I really appreciate folks buying the documentary poster. I have 250 at $25 each. I've sold about 100. The money is being used to finish the films with music and release. I am putting the names of the poster sponsors in the end credits of the documentary. 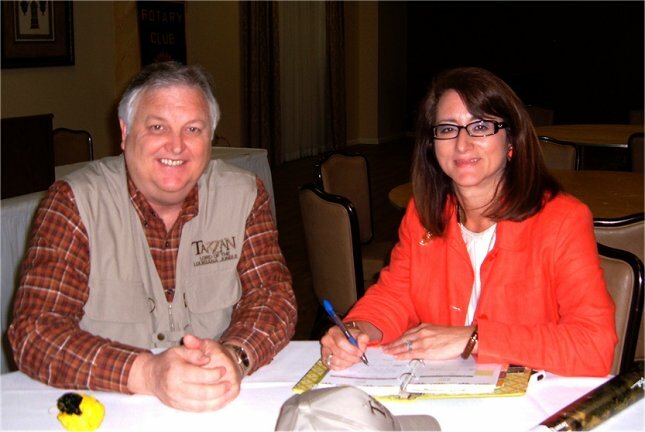 Carrie Stansbury is the director of tourism and the Louisiana State Film Office for the Cajun Coast. We are discussing the possibility of an event weekend or a Tarzan festival in 2012. Danika Foley and Lee Hudson are interviewing me for television and the newspaper. 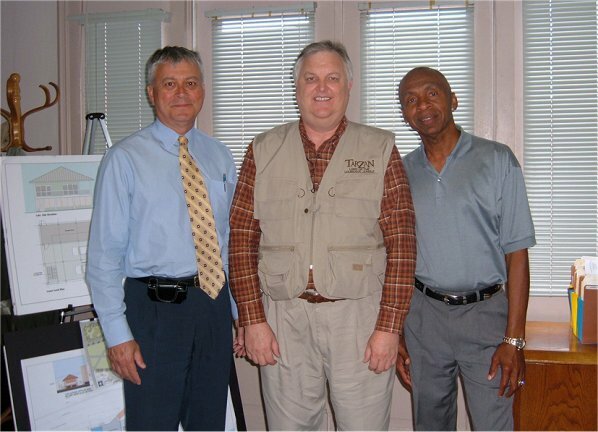 Pictured with me are Mayor of Morgan City Timothy Matte and Herman Hartman. We had a great visit and Mayor Matte's office has been helpful in the production of the documentary. 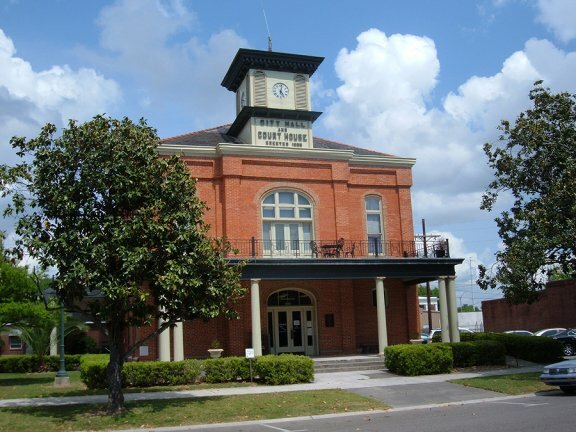 This is the Morgan City City Hall and Courthouse.